I had a very good art week. I am finally getting back into the swing of things. This week I did a couple of quick cloud watercolours, a pencil sketch of the crabapple tree, one longer watercolour yesterday, and a very long watercolour today. That’s what I need to be doing every week. Just lots and lots of art. Maybe it is knowing that I must have something to blog about every week–I need those deadlines. So this one took me four hours today. 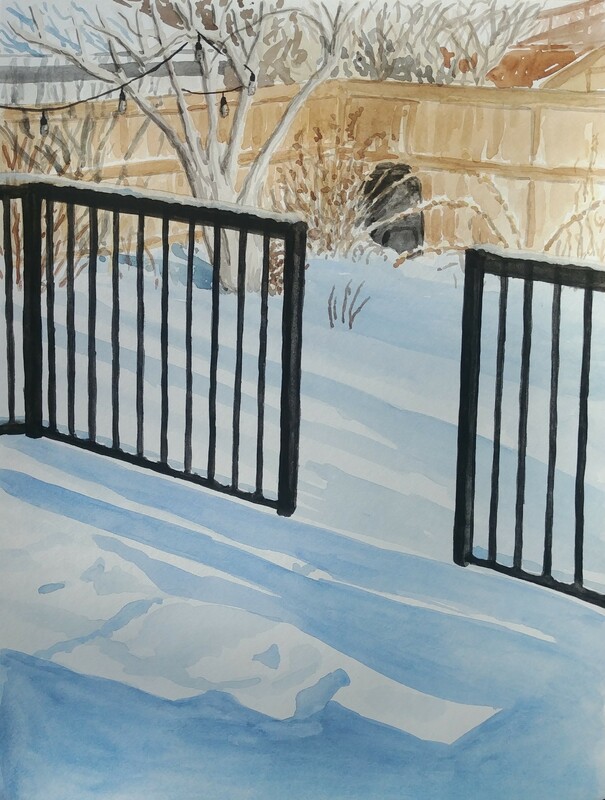 I started with the back fence and tree, then did all the ground snow and shadows, then added the railings, and lastly went back and added more detail in the background. I added the tree shadow at the end so it was actually an hour or two later than the ground shadows and by then the ground shadows were completely different, but it felt like it all worked, even though it is a bit invented. I think the tree shadow needed to be there. I also spent a long time on the railings–almost a full hour. In the past I have slapped the railings in at the end and not taken enough time to make sure they were straight. Yesterday’s painting did not go quite as well. 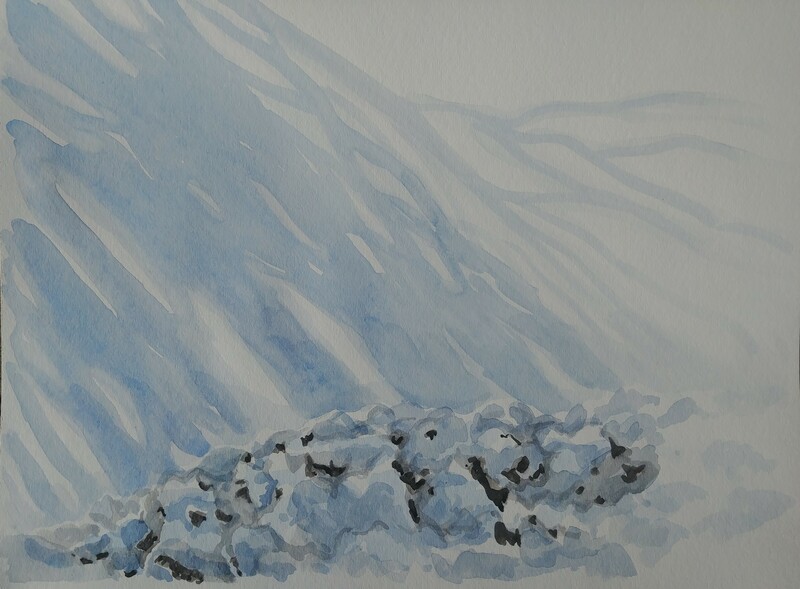 I wanted to paint the snow-covered junipers beneath the living room window, but it was a bit of a bumpy mess. Not only was it a confusing mess of bumps, but there were shadows on it too. I think that’s why I wanted to paint it, but I will have to attempt it again another day. The painting also suffered from lack of context–I zoomed in on just the juniper and ground shadows so it isn’t quite clear what you are looking at. Oh well, it did challenge me.